This gift features an incredibly delicious bicoastal pairing of Vermont Artisan Cheeses and California Gourmet Fruit Spreads. We've brought together Plymouth Artisan Cheese, producers of original American Heritage Cheeses in Plymouth Notch, Vermont since 1890, with Just Jan's All Natural Fruit Spreads, nestled in the foothills of California's Santa Monica Mountains. These award-winning cheeses and spreads will wow even the most sophisticated food connoisseur. Featuring Signature, Garlic Peppercorn and Sage & Herb Cheeses and Kadota Fig and Organic Strawberry Spreads. This is Plymouth's signature cheese, revived from the original Coolidge recipe. Original Plymouth is a full-bodied heritage cheese whose sharp flavor is rounded out with notes of butter, fruit and nuts. This spread is all natural and the perfect complement to a cheese platter, or a great way to change up your PB&J. ﻿Figs are good for your heart and high in natural sugars - there are only 8 grams of sugar per serving. This spread is made with juicy, organic strawberries and 14% less sugar than traditional jams and spreads. Perfect for toast, swirling into oatmeal, or a fabulous addition to a cheese board. It tastes like taking a bite out of a fresh picked strawberry. This gift features an incredibly delicious bicoastal pairing of Vermont Artisan Cheeses and California Gourmet Fruit & Savory Spreads. We've brought together Plymouth Artisan Cheese, producers of original American Heritage Cheeses in Plymouth Notch, Vermont since 1890, with Just Jan's All Natural Fruit Spreads, nestled in the foothills of California's Santa Monica Mountains. These award-winning cheeses and spreads will wow even the most sophisticated food connoisseur. 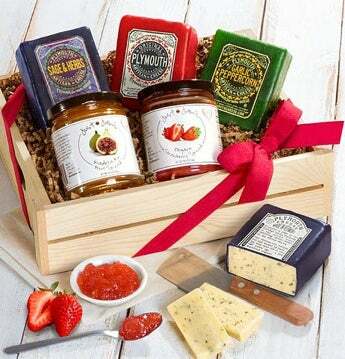 Featuring Signature, Garlic Peppercorn and Sage & Herb Cheeses and Kadota Fig and Organic Strawberry Spreads.